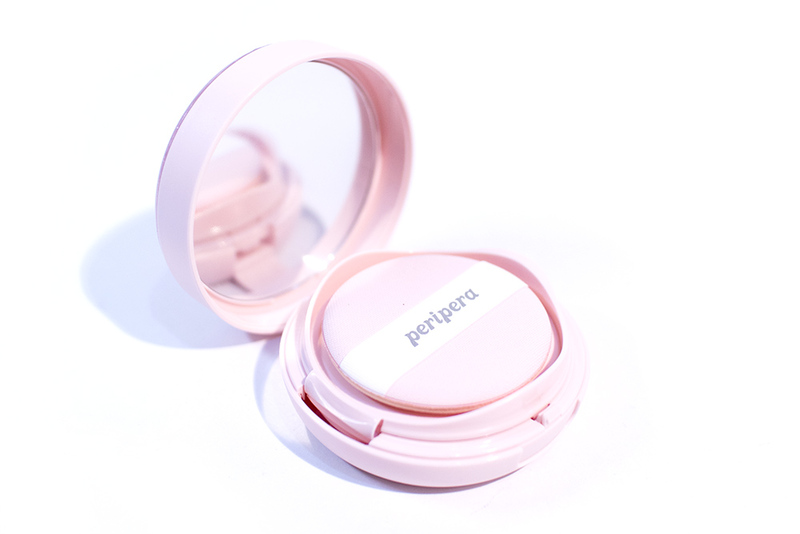 Review: Pearly Night Inklasting Pink Cushion (Peripera) – Oh My Stellar! I bought this product with my own money from the official store. However, this post also contains affiliate links to StyleKorean as an alternative shopping recommendation. These go towards supporting Oh My Stellar and future content. Holiday season means limited edition releases and, of course, some super pretty packaging to draw us all in. For this year, one of the stand out releases from Peripera is definitely their Inklasting Cushion! I grabbed this while I was in Korea and I was lucky enough that it was also on a special promotion, so I got a bit of a discount on it. The store assistant tried it out on my skin and I got shade 2 – I was originally looking for number 1 (which was sadly sold out in-store) but this product actually ended up being a decent colour on me and I think that the lighter one might have made me look a little ghostly. For reference, I typically use a shade 21 in Korean cosmetics. 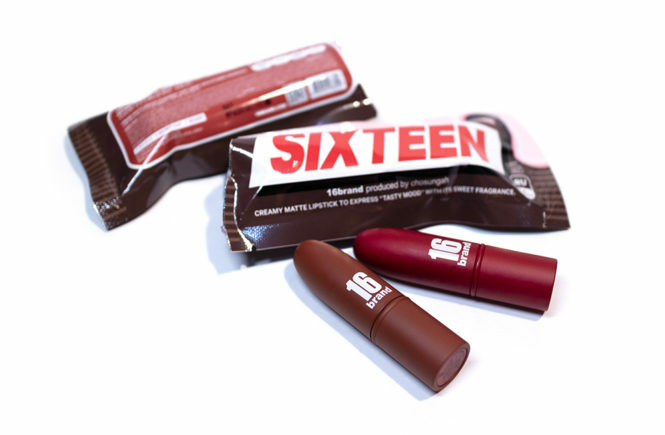 Personally, I’m a massive fan of the Peripera lip products but their base products have been a hit or miss for me – some are pretty good, and others I find a bit lacking. However, because of the prettiness of this cushion case, I had to give it a shot. This product comes in two styles – the pink and the lavender. To be honest, I’m not completely sure about the difference between them but I assume that it’s the same as the standard version – the Pink Cushion gives you a high coverage, smooth, brightened finish while the Lavender Cushion is more about giving a non-cakey, dewy glow that has buildable coverage. I actually picked the pink cushion more because of aesthetic than preferences (because the lavender one might have been more suitable for me) but I don’t mind so much! If you’re interested, the original version also has a Mint Cushion that has a more powdery finish and is targeted towards people with oily or acne prone skin. Anyway, let’s move onto this review because I’m so keen to show this case! So the cushion comes in a pink box with Pearly Night being the name of this holiday collection. The overall look is very trendy, feminine and fun – it isn’t elegant, but it does look to be of a good quality. 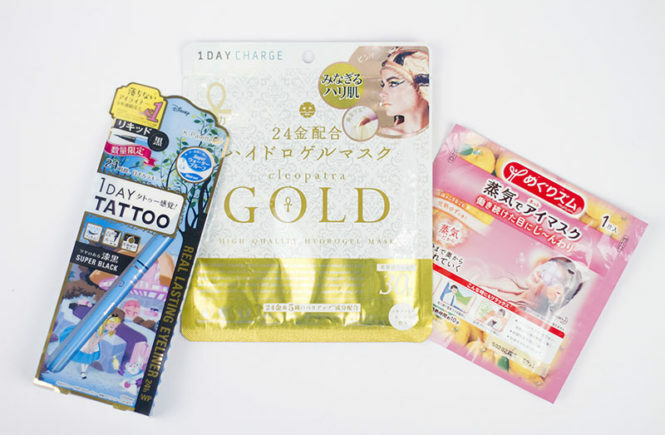 The design of the packaging is really eye catching and I like the use of small details like the clear rainbow foiling of the stars on the sides (see the below image). I think that it would look great as a Christmas gift; whether for someone special to you or yourself. 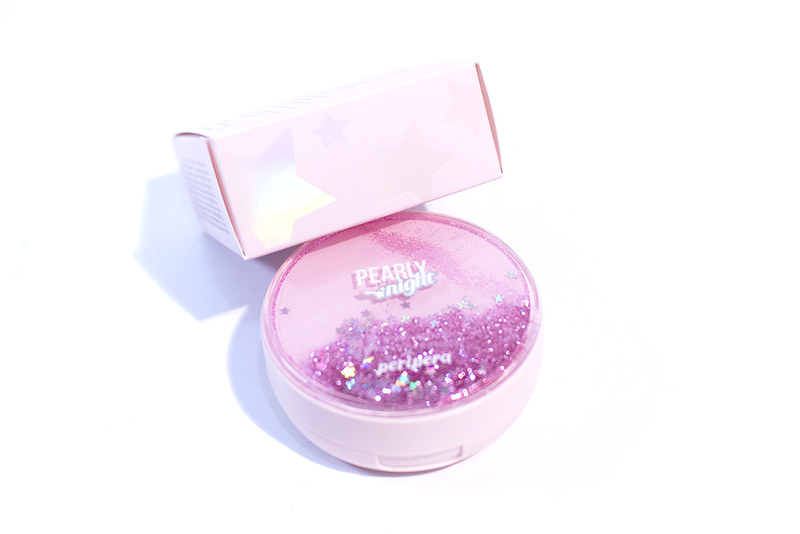 The actual case has a pink glitter layer – similar to a snow globe and it’s super eye catching. It clicks shut but doesn’t actually have a button to open it – it just pushes open normally. I don’t have any issues with the security of the case, but it does make me a little hesitant about it. It is also a bit bulky. I can carry it in my make up bag easily, but I prefer the sleeker designs that are more popular nowadays. 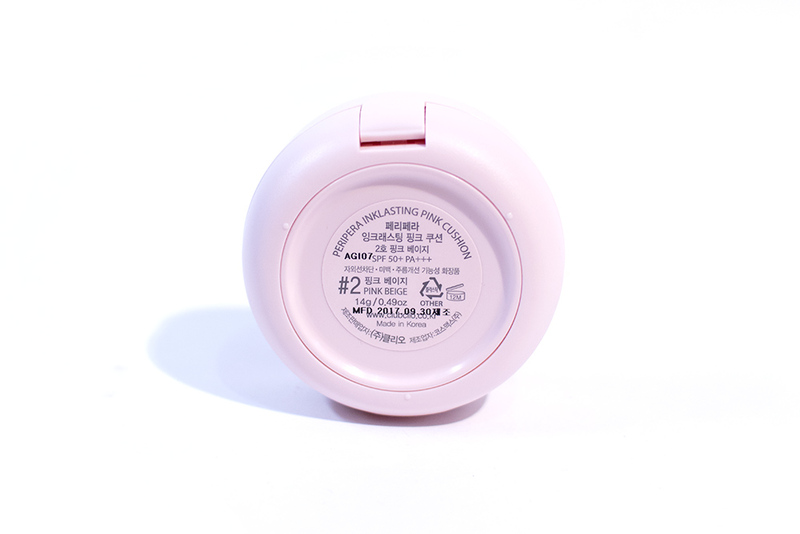 The Pink Cushion is sold without a refill – which is a little disappointing – but if you were to buy any of the other Inklasting cushions then it should all fit in the same. It seems to have a similar case to the original. 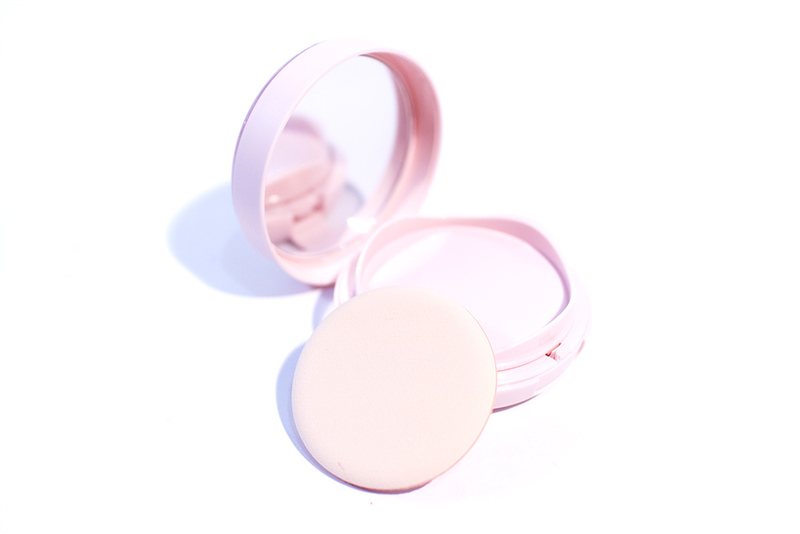 The case opens up to give you a full sizes mirror and the puff – the puff is very soft and cushiony, also rather dense, so it’s really effective in application and blends out the product really well. I also like that the cover (the one that goes over the sponge) also clicks in place really securely so you won’t have issues with the product drying up. My only complaint about this cushion – and it’s the same issue for the Clio products too – is that the underside of the puff is beige coloured and therefore would stain easily even if I wash it. I prefer a darker coloured puff for that reason. I have also read that this isn’t a rubycell puff, which explains why it seems more cottony than the others that I have used. Although it works well, it also seems to absorb more product. When you open it up, the sponge is a fairly standard design. It isn’t too thick, on the contrary to the case, so you don’t need to press down hard to retrieve the product. I think that, in the long run, this will make the cushion much easier to use up. The sponge is really saturated and a little goes a long way. And above is the cushion on my hand! It doesn’t show very well on the image but it does have a slight brightening effect. However, it still looks fairly natural on my skin tone (since I am relatively fair to begin with). 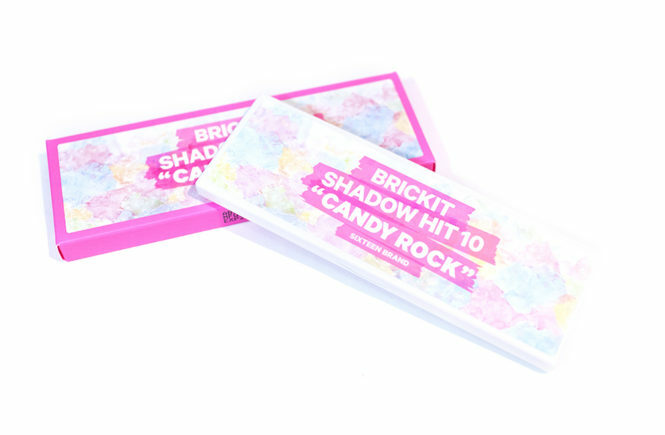 The formula applies really smoothly and it absolutely blurs out pores without a hitch! 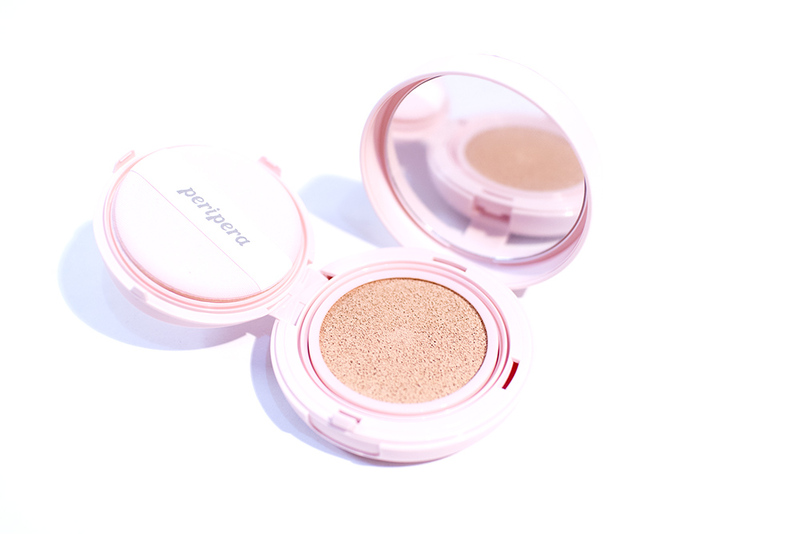 It has a dewy, hydrating finish and it really does make your complexion look amazing. Apparently, it has a ‘pink light filter’, which I suppose means that the cushion has a pink tone base which can give you a brighter complexion. I would say that this as a medium coverage that can be build up to a high coverage. As I said, a little goes a long way, and I feel like too many layers of this can feel a little bit heavy on the skin so I would recommend that a concealer be used together with it. My skin texture is left looking really healthy and glowing. 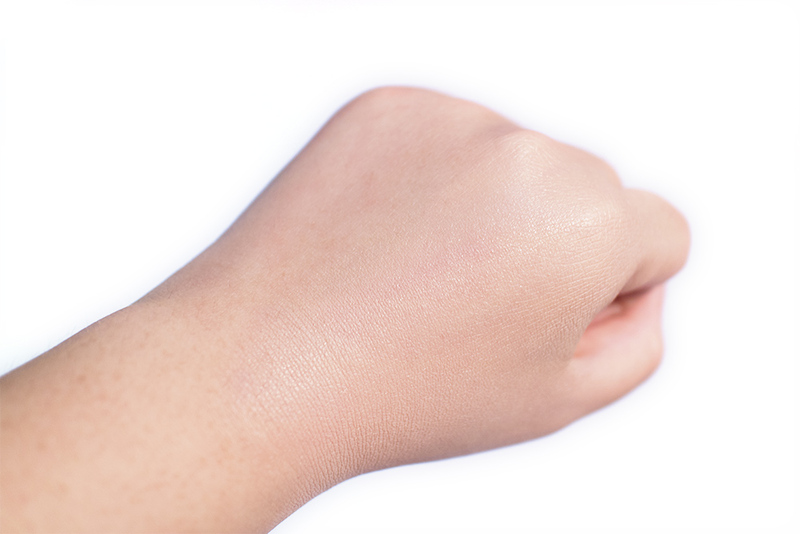 The product doesn’t fully dry down but it has minimal transfer – touching my skin afterwards isn’t an issue and other products blended out fine on top of it. The Inklasting Cushion is also touted as a long lasting cushion but, unfortunately, I would have to disagree in this case. It does last well for a few hours, so it’s decent, but I find the product breaks up around my t-zone by the afternoon and needs to be reapplied. Touch ups are easy because of the blendability of the product, but any ‘swiping’ motion around the nose will make the product gather weirdly in pores so that’s the main area that you have to be a bit careful with. It doesn’t control oil so it is better suited to dry or combination skin, or you will need to set with powder and blot. I think that this cushion would be suitable for dry or dry-combination skin. It has a very dewy finish so, if you’re a fan of that, then this is worth checking out. Even if not, the packaging is really pretty anyway! Personally, I think that I’ll be going to wear this cushion mostly on days when I’m not out for too long – a few hours is find but it won’t last for my longer 12 hour days. I bought this product in Seoul, but you can check out most (if not all) of the Pearly Night range at StyleKorean. Unfortunately, both the Pink and Lavender cushion are temporarily sold out at the time of writing, but it’s worth checking back to see if they’ll bring it back in!